Welcome to Smith Farms Boarding! We love dogs and can’t wait to meet yours! We have been married for 15 years and have moved from Washington State to fulfill our longtime dream of living in Georgia and following out passion for pet care. 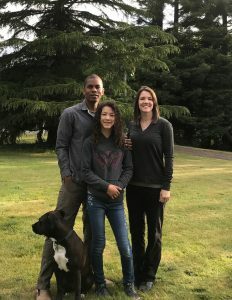 We feel so blessed to have the opportunity to take over the torch for Smith Farm Kennels and continue the legacy that Bridgette and Sandie have developed – Thank you! We love the outdoors, especially hiking, kayaking, fishing, and mountain biking, and we always take our family pet Luna with us – now we are looking forward to having her come to work with us every day! Our daughter Leilah is 11 years old, loves dogs and wants to learn the ins and out of the entrepreneurship by participating in our new business adventure. Leilah provides cuddle time for small and very friendly dogs. You will see all of us in various parts of the property as we learn the ropes from Bridgette and Sandie. – their mentorship in learning the peculiarities of each of your furry family members is greatly appreciated by us. We are looking forward to meeting your family, with its two and four legged members, and promise to continue the high standards of pet care set by Bridgette and Sandie. We firmly believe that even the most pampered dogs enjoy sunshine, fresh air and grass between their toes. We care for your pets with the clear understanding that each of our guests will require individual love and attention. The health, well-being and happiness of our guests are always the main priority in our minds and hearts, and we’ll treat your babies with the same affection and respect that we give to our own. Our facility is kept impeccably clean – with “maid” service provided every morning, and spot cleaning throughout the day as needed. You can feel confident that your dogs are being left in a caring and clean environment.